Last night we partook of the annual burning man festival, you know, the one were we torch the effigy of a terrorist rather than the one involving lots of techno-hippies in a desert. 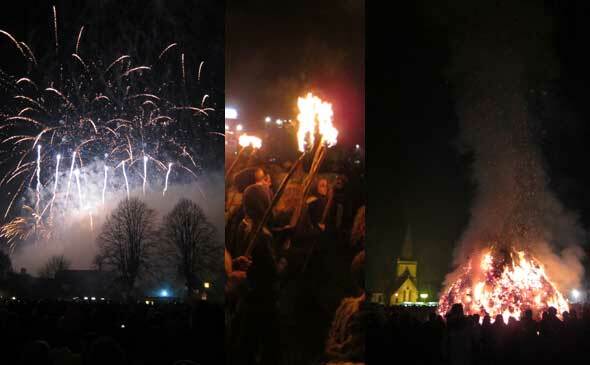 As with last year we ventured out of the safe harbour of London down to the small country town of Brockham, home to one of the largest fires and firework displays in England. Brockham Bonfire is a village tradition dating back at over 50 years. An epic bonfire pile is constructed on the village green in the six weeks leading up to event, and on the night people can join in the flaming torch parade round the village culminating in the lighting of the fire. It’s a wonderful night out, with a mix of locals and out of towners joining in the, generally, good natured fun. There’s something very ‘Wicker Man’ about the whole thing, with the faint whiff of health and safety interleaved with the familiar threads of English village life carrying on as it always has. Our family connection to Brockham goes back even further, with my mum and aunt growing up there and my parents being married in Brockham church. My Gran, now 93, used to commute in to central London every day – a drive that took almost as along as it would today due to the slow speed of cars, not the weight of traffic on over stretched words. Come the early eighties the various parts of my family upped sticks and moved in together in Camberley, where our family home would be for the next 25 years. Times change and people move on, but somehow Brockham feels un-touched to me. This obviously isn’t the case, with new, rich London commuters forming part of the community and estates built where there used to be fields. The piles I used to climb up as a child are no longer at the end of the road and the old asbestos bungalow has been replaced by one of modern construction. These small changes are masked by the flame light as we followed the procession around the village and back for the lighting of the fire. The crowd, slight on our departure had grown large, squeezed into the village green to enjoy the spectacle on this brisk yet dry autumn evening. After the Guy is safely affixed to the top of the fire, and the people counted down from the top (after previous incidents..) the torch bearers are allowed to stand around the fire, jostling for position. This is not for the feint of heart, or the flammable of hair. Torches placed into the base of the fire (“below six feet please, no throwing!”) the flames quickly take hold, driving out the moisture of the last few rainy days and eventually reaching Guido Fawkes himself – triggering the loud retorts of hundreds of fire-crackers stuffed within him to loud cheers. With the fire warming us all from a safe distance, the fireworks commence. £50,000 worth this year, in a short but epic display. Perfect fireworks weather, clear, chill and with a slight breeze taking the smoke away from the display. The cheers of everyone attest to the magnificence of the display. You know the deal; “Ooo!” “Aaaah!” “Sparkly!”. Finally, the hog roast, my highlight of the night. Two pigs roasted over an open fire since 10am that morning, are butchered and auctioned by Ron, wearing his traditional black cloak with stuffed ravens on the shoulders and fighting epic feedback from his mike. Our own swag was £25 worth of tasty loin and crackling, eating warm straight from the plastic bag. Lush. All that remained was to walk past the crowds of drunk under-age kids gathered in the car park fields, hiding from their parents’ gaze to find our car was one of the last left. Then the drive up the steep side of Box Hill back into the environs of London, and a swift negotiation of more drunk folk tipping out from pubs in Clapham. Ah, life in Britain hasn’t changed so much really.